The owners of Junk King San Antonio, Mike and Carol Hasselbalch, were watching early morning TV in their home, when the local news came on. The news station was covering the recent flooding events on the border of Mexico in the towns of Laredo and Nuevo Laredo, about 200 miles from San Antonio. The scene on the television screen was grim: the flooding caused by hurricane Alex was displacing families, destroying hospitals, spreading illness and making basic necessities hard to come by. The TV station mentioned that the aid group People Helping People was organizing a drive to the border town to bring rations to those in need. Mike and Carol immediately knew that they needed to offer their services to the cause. They called up the TV station and asked how they could help, offering the aid of one of their Junk trucks to haul resources. 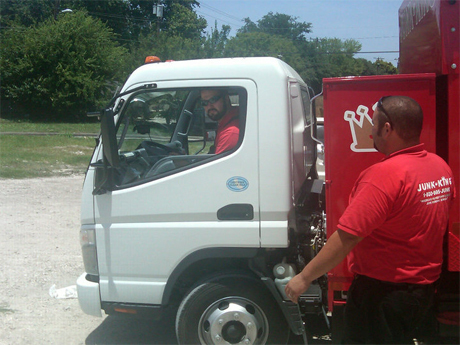 One of Junk King’s drivers, Alex Ortiz, donated his time to haul the rations down to Laredo. Within a week, Alex was on the road. His truck was filled with food and basic necessities like water, rice, beans, canned goods, bleach, toiler paper and diapers. After he dropped those rations off, the Junk King San Antonio team decided one trip wasn’t enough. The towns along the Rio Grande were still facing incredible hardships because of the flooding and still lacked basic necessities. Apparently the conditions were so bad that people were killing each other for food. Mike Hasselbalch decided to make another trip himself, this time hauling the goods to the Salvation Army in Laredo, who then shipped the goods over the border to Nuevo Laredo. 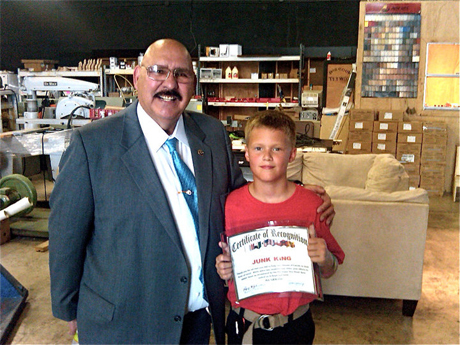 Junk King San Antonio, and all of the Junk King franchises around the country, have always made an effort to help out the communities around them. Sometimes, like in the case of the town of Laredo, a community in need is a bit ‘off the regular route.’ This distance didn’t deter Alex and Mike from making the trip. Like them, many of Junk King’s other hard working professionals are also glad to lend a helping hand. This entry was posted in Flooding, junk hauling, junk hauling business, Junk King San Antonio, junk removal, Laredo and tagged Junk King San Antonio, laredo flooding, mexico on July 30, 2010 by Junk King. Last updated July 30, 2010 .